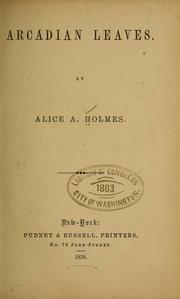 Born in Norfolk, England in 1821, Alice Holmes was one of many who emigrated to the United States after the war of 1812. It was during this crossing of the Atlantic that Holmes was struck down with smallpox that resulted in her losing her vision at the age of nine. 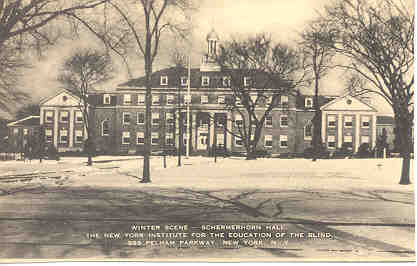 After settling in Jersey City, Holmes lived a quiet life until the year 1834, when an act was passed that allowed a set number of State students to enter the New York Institute for the Blind. She entered the Institute in 1837. It was at the Institute that Holmes learned reading, math, and music. She also learned how to sew, which would prove to be quite useful since it came to be the main source of income. As a blind woman in the 19th century, there were times when Holmes would fall into depression. During these times she would turn to poetry. It wasn’t until family and friends encouraged her that she published her first book, entitled Poems in 1849. She continued her quiet lifestyle until she died in 1914 at the age of 94. Ten years after her first publication, Holmes came out with another book called Arcadian Leaves. This book was a culmination of not just her poetry, but her prose as well. The book, like much of the poetry in the 1800, focused largely on religion and Holmes’ love of her family, friends, and even her homeland of England. The lyrical way in which she writes her poetry brings a kind of magic to her writing, and the prose is versed so that the reader can’t help but feel the hope, love, and sadness of her characters. During the 19th century the Romantic movement began sweeping its way across America. Artists, writers, musicians, and even philosophers were beginning to become discouraged when they noticed that, due to America’s industrial advancements, part of the human was getting lost amongst the machines. Romantics believed that this human element was something of great importance and could not be replicated by machines so they began to focus their work on the power of emotions, freedom, and imagination. Among the greatest romantic authors were Nathanial Hawthorne, Henry Wadsworth Longfellow, and Emily Dickinson. Within the ranks of these authors, Holmes fits squarely. Her poetry and prose speak to the imagination by allowing readers to conjure up images of the places she is describing thus invoking a feeling of longing for said place. The New York Institute for the Blind was the home of Holmes from 1837-1844. In her novel, Lost Vision, she speaks of her time at the Institute and how she made friends with her roommate Fanny Crosby. Holmes also goes on to talk about the day to day activities within the institution with regards to her education. Founded in 1831, the NYIB was dedicated to teaching those without their sight to do the things that those with sight could do such as reading, writing, music, and arithmetic. 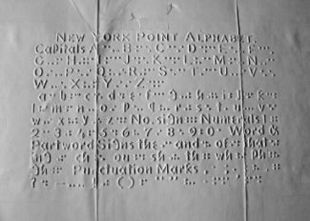 They also used an early form of Braille called New York Point that was invented by a teacher at the Institute called William Bell Wait. 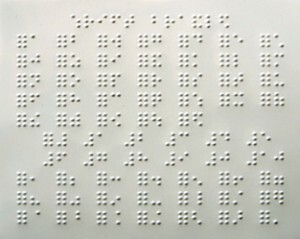 Braille itself, though created in 1825 by 15 year old Louis Braille, would not be officially taught until the year 1868.